The UK Meteorological Office released provisional statistics earlier this week indicating that 2012 was the second wettest year on record since data collection began in 1910. With four of the five recorded wettest years occurring in since 2000 and longer term (30 year) averages indicating a 5% rainfall increase, wetter weather and more intense rainfall may be something for us to get used to. The Rib Valley has seen it’s fair share of heavy precipitation in the last few weeks, though thankfully no severe flooding of the river has resulted, as in other parts of the country. I took a walk to investigate just before Christmas after hearing media reports of a driver requiring rescue from his van at Barwick Ford. 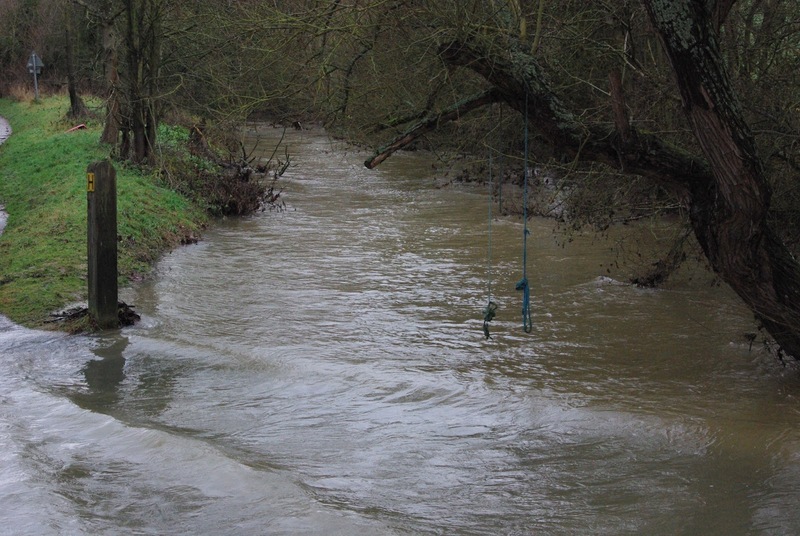 I picked a dry day, the morning after further heavy rain had swollen the Rib, bursting its banks and submerging parts of the lane down to Great Barwick Ford Manor. 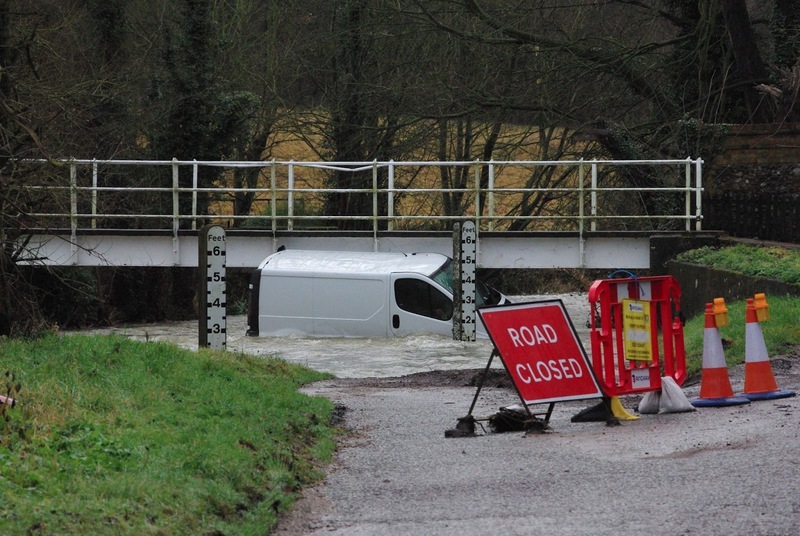 The errant Ford Transit was still in the flow, though the river had now receded back to within its normal banks. Height markers showed the river now down to a foot in depth (from what I suspect was a four foot high point) but clearly still running with some force. 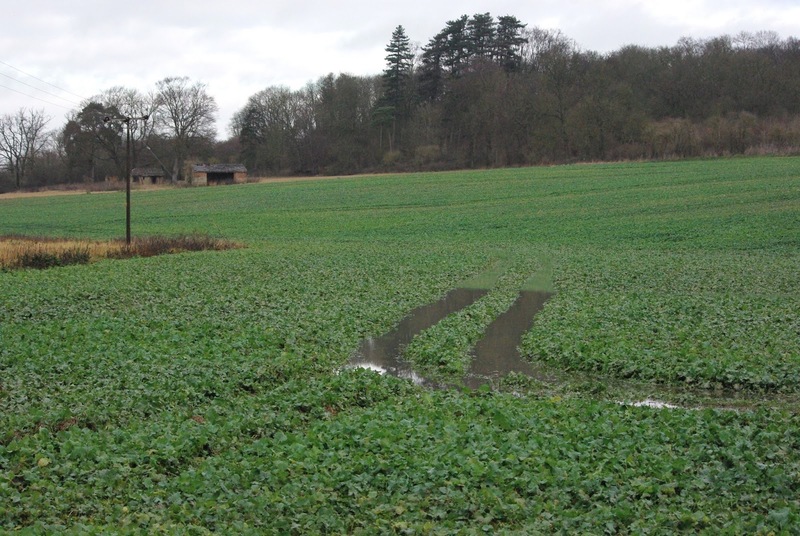 Flooded tracks in the surrounding fields betrayed the saturated fields so I sought a path on higher ground, following the Harcamlow path north. 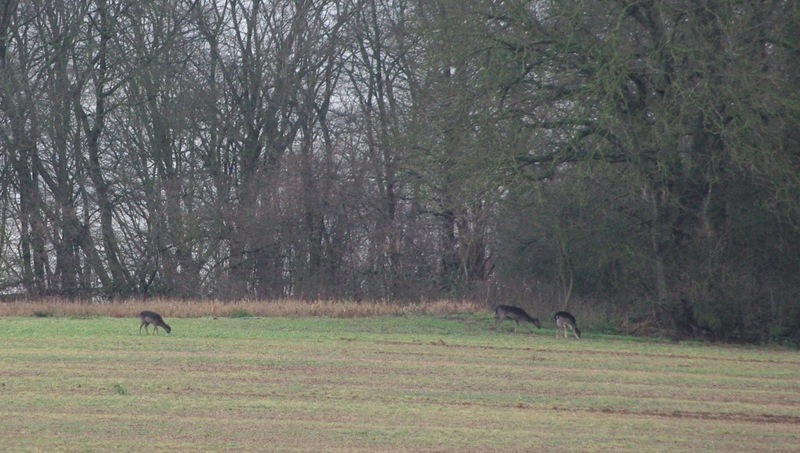 On the other side of the valley a small group of fallow deer were feeding in the shelter of the plantation. Tucking into the woods, the path was still sticky underfoot and the trunks and branches were dark from the downpours of last days. 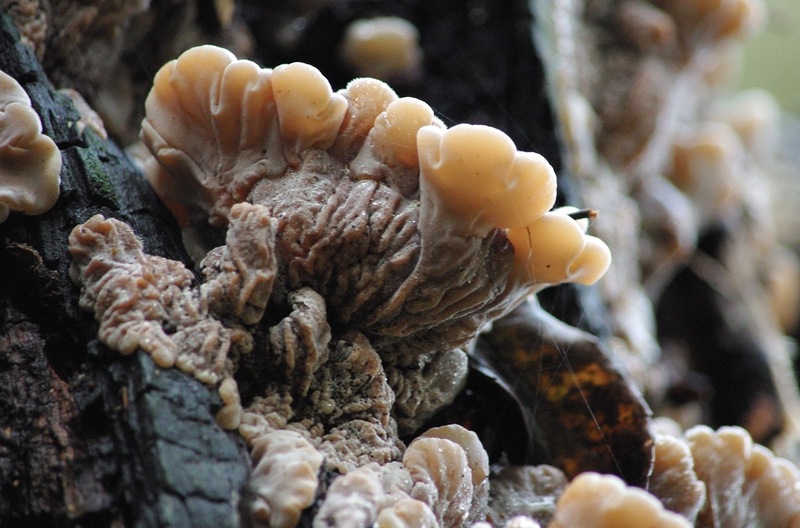 An ancient tree, reduced to a head-high hollow stump, its heart wood opened to the elements, now cradled an as yet unidentified fungus – a return visit to see how it develops will likely pay dividends. 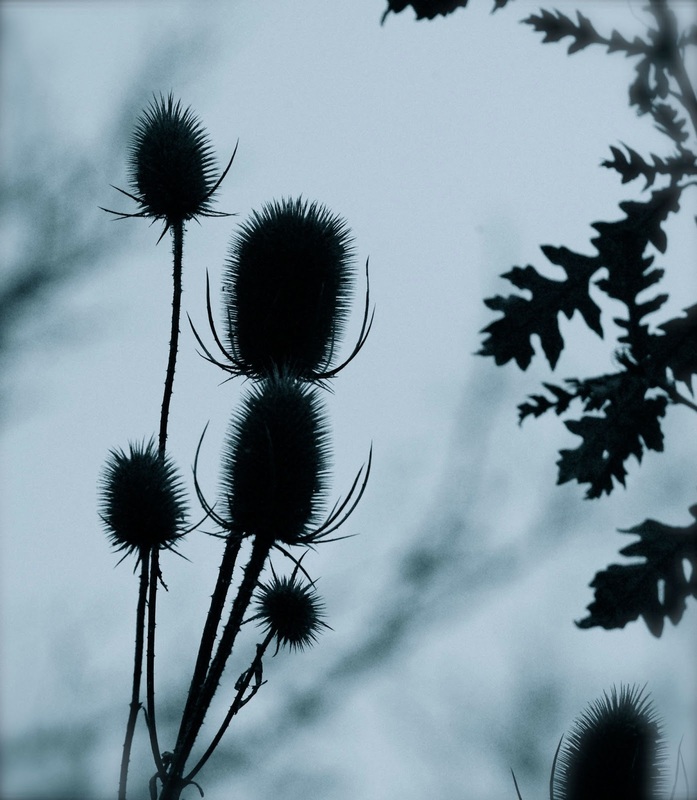 It glistened in the damp environment, bringing to mind a frozen waterfall, cascading down the sodden wood. Moving on, the wood changed to elder scrub, producing a tunnel for the path below more mature trees including the magnificent scots pine, oak and birch. 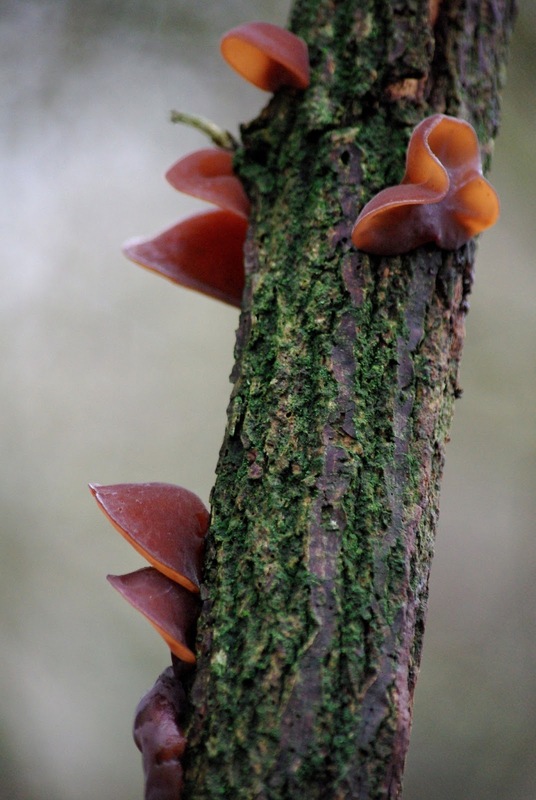 On the trunks of the elder, the distinctive auricularia auricula-judae fungus were thriving in the damp environment, its velvety flesh delicately translucent in the winter light. Auricula-judae’s common name is Jew’s Ear, Jelly Ear, themselves corruptions from Judas’s Ear, the name derived from the belief that Judas Iscariot hanged himself from an elder tree. 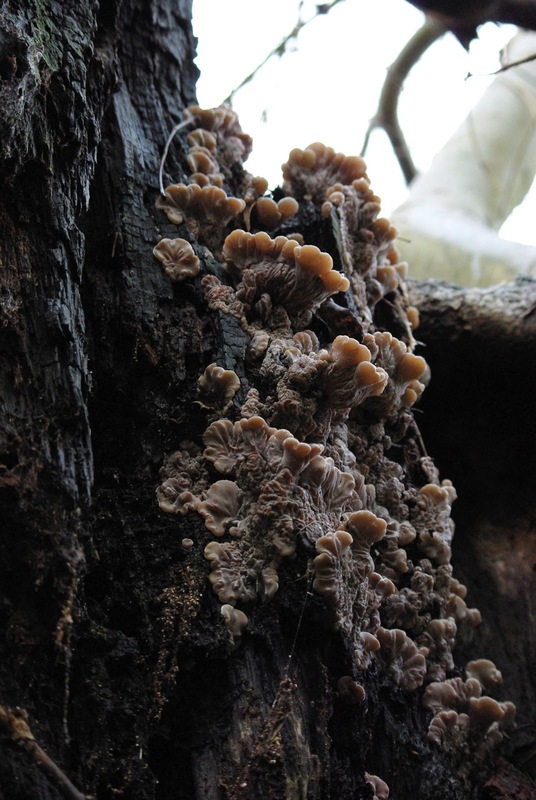 The fungus is edible and a delicacy in China, used in many recipes as well as Chinese medicine. It is cultivated as a blood tonic in Ghana and was a treatment for sore throats, sore eyes, jaundice and as an astringent in the western folk medicine tradition up until the 19th Century. Modern research hints at even more exciting possibilities. Next, the path led to a more open planting of hawthorn. 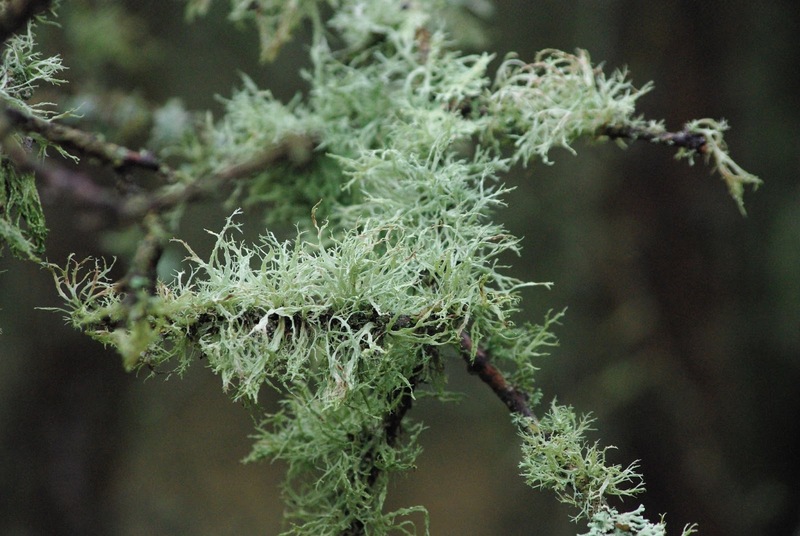 The branches were adorned with the white and pastel green fruticose lichen, like cobwebs spread across their delicate branches. 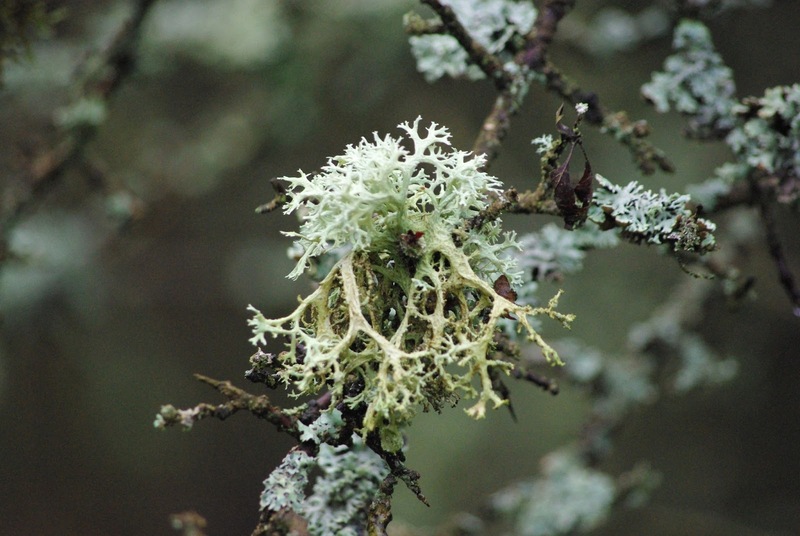 Lichens are a fascinating organism, or more accurately, composite organism. The fungus element (or mycobiont) works in a symbiotic relationship with its photosynthetic partner (the photobiont), each benefiting from the other through the transfer of nutrients. 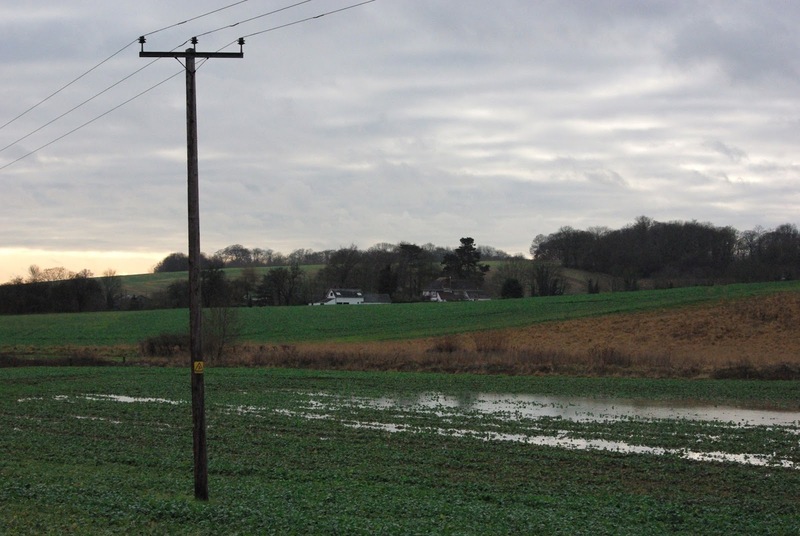 Out now into agricultural land, further puddles betrayed the extent of earlier flooding. 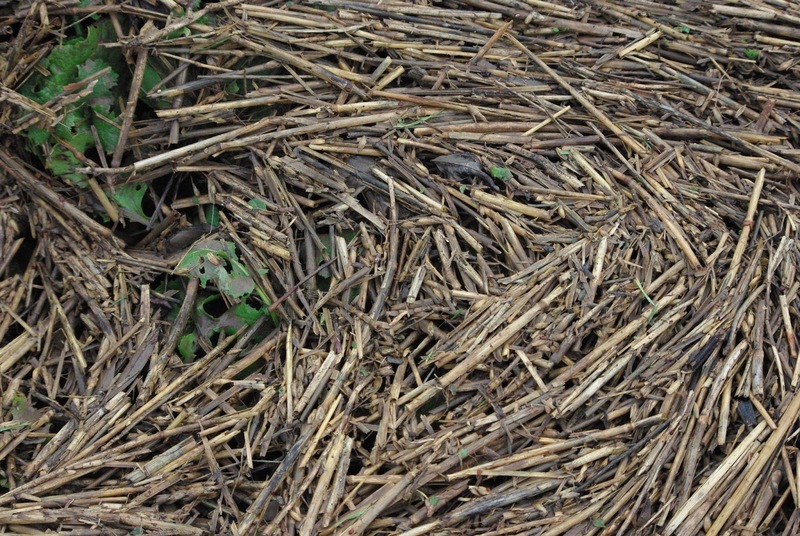 Stubble debris deposited by the flood swirled into abstract shapes reminiscent of the work of Andy Goldsworthy. 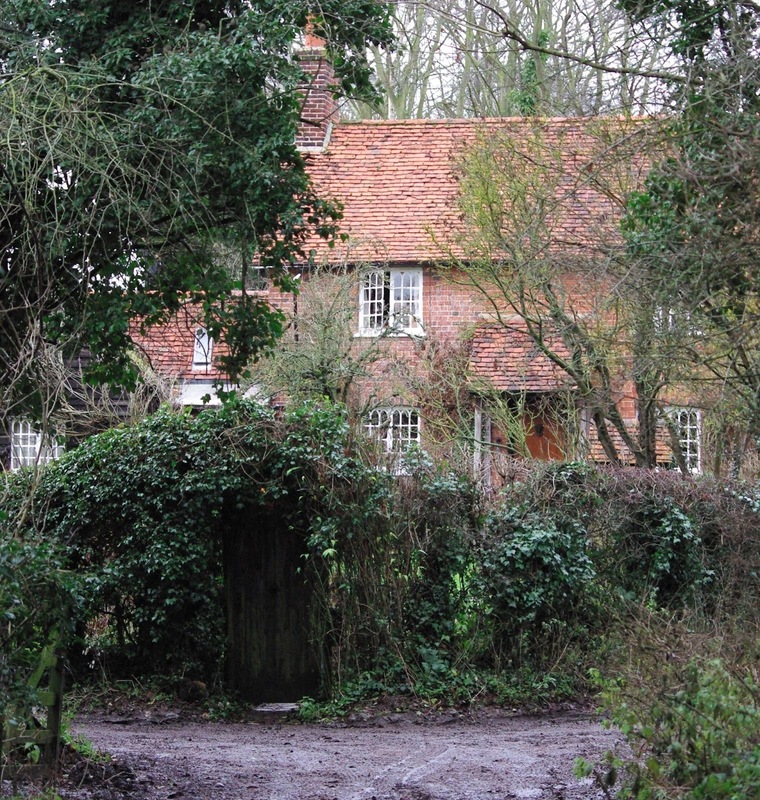 My path headed home now, crossing the river and passing by the ‘gingerbread cottage’ at Hanging Wood corner, then on, southbound down the lane, the verdant moss on a willow stumps fluorescent in the shadow of the trees. Up the last rise and down into Barwick, the lane descending to give a panoramic view of my walk. Time to reflect on the power of natural forces to change and mold the landscape and on the fascinating discoveries you can make when putting one foot in front of another in the countryside. Lost in my muse, a dot of a bird caught my eye a mile or so away to the south, above the ford. I nearly failed to raise my binoculars to check it out, convinced that it was a crow passing down the valley. With a smile filling my face, the realisation came quickly that this was no crow, but the first Red Kite seen by my eye in the valley, a wonderful finale to a winter walk that started out as an investigation and ended as a wildlife safari, of sorts. Andy Goldsworthy, auricularia auricula-judae, fallow deer, Flood, Jelly ear, Jew's ear, Judas's ear, Ramalina farinacea, Red Kite. Bookmark.